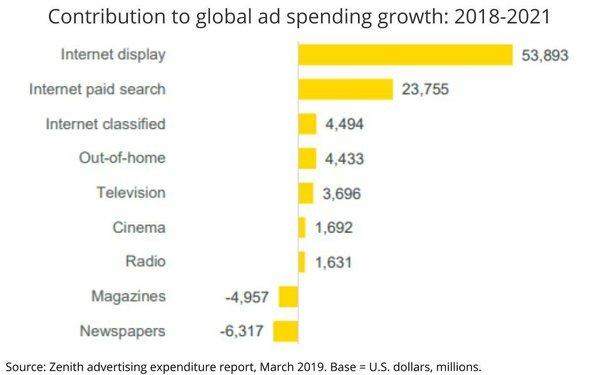 Thanks largely to incremental ad spending on the internet, global ad spending will expand by more than $82 billion through 2021, predicts Publicis Media's Zenith unit in an update to its quarterly advertising forecasts. "Stronger-than-expected internet advertising will drive 4.7% growth in total global ad spend in 2019," Zenith Head of Forecasting and Director of Global Intelligence Jonathan Barnard said in a statement released with the report, adding: "That’s substantially ahead of the 4.0% forecast made in the previous edition of the report, published in December 2018. Zenith forecasts 4.6% growth in both 2020 and 2021, ahead of previous forecasts of 4.2% and 4.1% growth respectively." 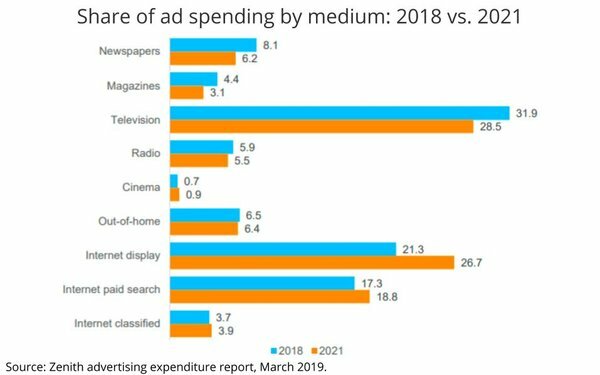 While all non-print media are projected to expand, most of the growth will come from internet display, followed by paid search and internet classified advertising. As a result, the internet's share of global ad spending will expand by 7.1 percentage points to 49.4%, overtaking TV's dominance. TV's share of global ad spend will erode by 3.4 percentage points to 28.5%. "We have upgraded our forecasts after internet ad spend markedly exceeded our expectations in 2018," Barnard explained, adding, "We now estimate that internet advertising grew 16% last year, up from our previous forecast of 12%."